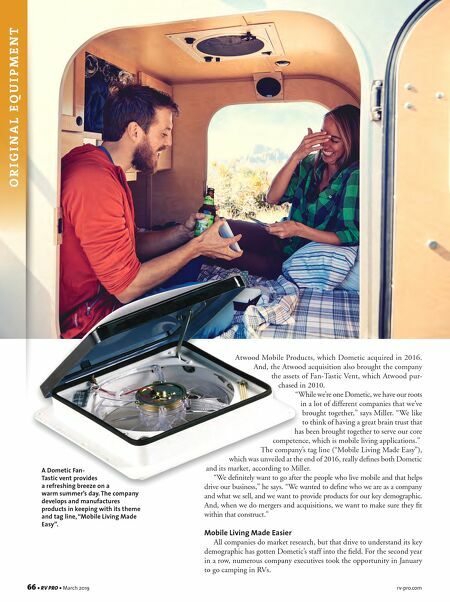 rv-pro.com March 2019 • RV PRO • 67 "Last year was the first year we were able to rent RVs and go out to the desert and live the life," Teverbaugh says. "It's our product management team and a few people who are in sales. We also have a team that lives on the road and helps us connect with customers." She explains that the main emphasis is on people who live the RV lifestyle full time, whether younger people with families who are working on the road, or retirees. The goal is to focus on what's next for them and how to best incorporate that into Dometic's products to make their lives easier. Speaking from the climate control side of things, Teverbaugh says a big concern of RVers is reliability. "They want to make sure that when they need cool air it cools, and when they have the heat on it heats," she says. "That's especially important for pet owners who want to make sure when they bring their pets back to the RV that the air has cooled down." That's the reason behind the release in 2017 of the company's Bluetooth Thermostat App, and why the company is working on an entire connect system that will allow RV owners to not only access their climate-control equipment, but also things such as the company's mobile coolers through their phones. Miller says its latest efforts in that direction will be in display at RVX. Adding to the challenge: There's certainly no one-size-fits-all answer when it comes to air conditioners or vents. "Not only do we want to service multiple markets, but we need to have different tiers of products that will fit different types of vehicles," says Teverbaugh. "A nice air conditioner for a Class A would be our Penguin, which has a low profile and meets their need for less clearance. But we also need to have a product that's right for a 15-foot unit." Miller says the same holds true with Dometic's line of vents, which aims to offer what he describes as a good, better, best scenario. "We like to think the features increase as the needs of the consumer increase," he says. "If you have a small trailer, you want to turn on the vent and bring in fresh air. But, our 7350 series has 14 variable speeds, thermostat control, a remote control and a rain sensor that allows the lid to close automatically whenever it gets wet. In a fifth wheel, you might not even be able to reach the vent, so a remote is a great option." Robust & Deep The ability to understand and meet the needs of all its customers certainly holds true as Dometic serves both the OEM and aftermarket segments of the industry. The company is understandably proud of the Fuzion Omni Chill Super high-effi- ciency air conditioning system that it designed for Keystone's Fuzion fifth wheel, which was introduced in late 2017. Utilizing Dometic's high-efficiency fans and compressors, the Fuzion Omni offers 50 percent more cooling power than any other towable on the market and allows all three units to run at the same time, according to Dometic. "We like to partner with the OEMs, and we really want to be involved from the very beginning," Miller says. "When they come up with a new floorplan or a new design, we want to be in the mix so we can help design or innovate and bring together pieces of a system to best meet their needs." "A big goal for our project management team is to work very closely with the OEMs," Teverbaugh adds. "We've been setting up innovation sessions with the OEMs and taking strategic people from their teams and putting them together with our teams to talk innovation and what their needs and their customers needs are and what we can do to meet them." That's not to say a model from one of the company's existing product lines isn't going to do the job. Miller estimates that's true up to 95 percent of the time. "With the others, we work to innovate, make changes or make alterations as needed, but we feel we have a very robust and deep product offering," he adds.